Don’t spend a lot of time on the Avenue des Champs-Élysées. Though well-situated between the Jardin des Tuileries and the Arc de Triomphe, this iconic street houses mostly big-name stores that you can likely find at home, like Nike and Zara. If you go, do stop by the flagship Louis Vuitton. The little flea markets still have a lot to offer. 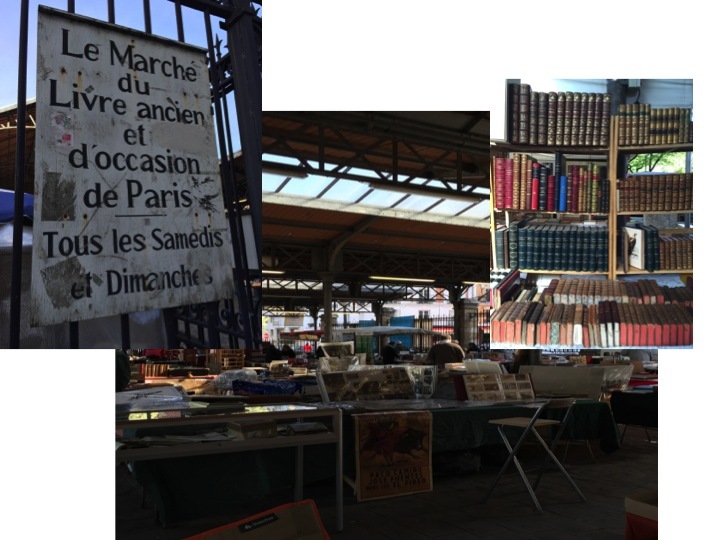 Though I consider myself a serious shopper and would love to one day spend days at the infamous Marché aux Puces St.-Ouen de Clignancourt, one week in Paris with the family was not the time to do it. So I decided to get my fix by browsing the smaller Marche aux puces Porte de Vanves in the 14th. 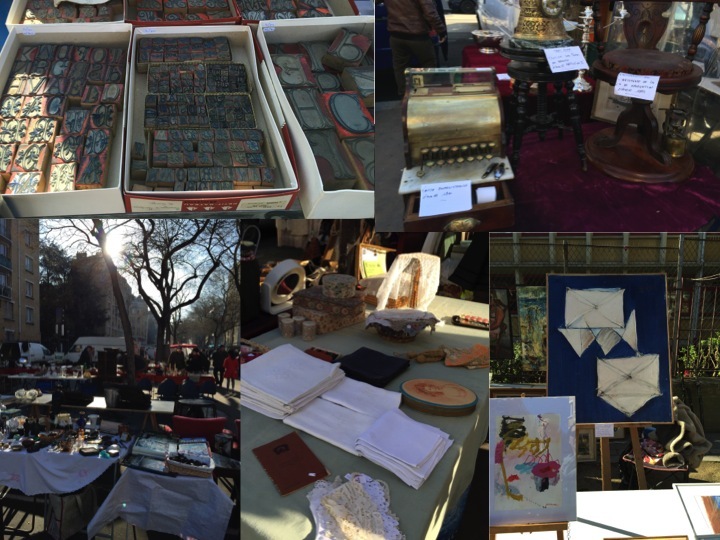 This market was just right for a half day excursion and offered lots of quality goods. There were many items that caught my eye, but at the end of the day I hit flea market gold and purchased an original painting and a modern lithograph. Since it wasn’t going to get much better than this for me (and the painting was quite large), I left before exploring the whole market but thrilled with my finds. After leaving the flea market, my friend took me to this quaint book market. If only I had free hands (and could read French!) to pick up some of these vintage beauties. You can’t visit Paris without stopping into some of its most famous fashion houses. The original Chanel and Goyard are on and along Rue Saint-Honoré, as is the well-known concept store, Colette. The iconic Hermes is located in St. Germain. The store front did not even hint at its jaw dropping interiors, shown below. I couldn’t help but laugh at the embossed leather sign by the scarves that says, “Touch With Your Eyes” in French. The same signs were displayed in English, but the French ones are much more charming. My favorite part of shopping in Paris was discovering small boutiques. Who wants to travel across the world to get something you can find at home? 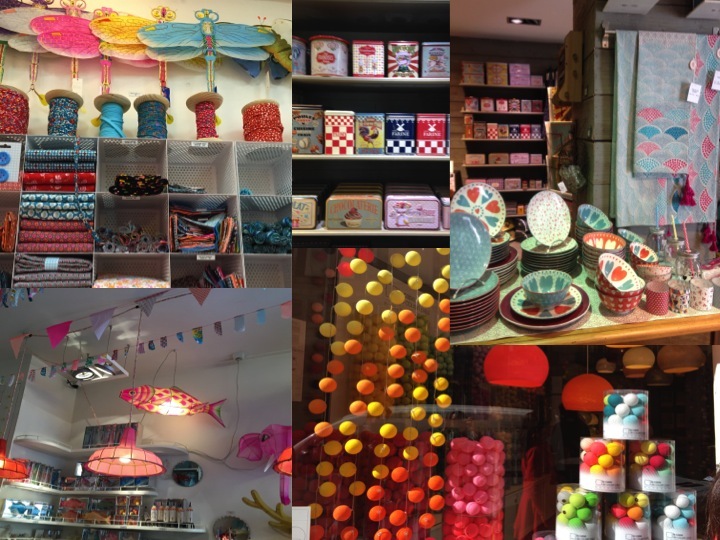 I found the most charming and stylish shops in the neighborhoods of Le Marais and St. Germain, and luckily for me, the latter was our home away from home. In Le Marais, we found everything from eclectic boutiques to well-known French brands such as APC and others that were new, but just as covetable. 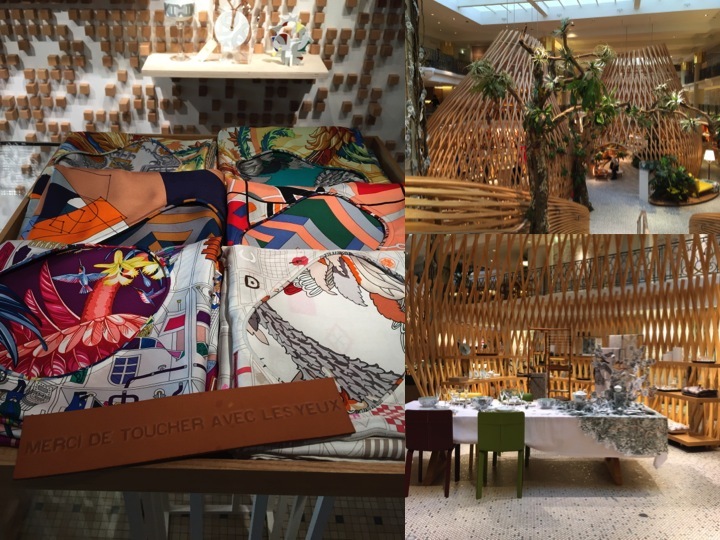 The concept store (big in Paris, apparently), Merci is also in Le Marais, and is a must-stop. St. Germain was a design lover’s shopping mecca and in my opinion, had the best mix of small shops and larger high-end brands. And of course, it is home to the infamous Le Bon Marche, which itself can make for an enjoyable afternoon since it houses many brands not available in the Bay Area all in one beautiful store. Plus, if you need a break or a bite to eat in between shopping, hop across the street to Le Bon Marche’s fantastic gourmet market where you can find great gifts and prepared foods to take home after a successful day of shopping.